One of the most important things that hardly miss whenever continued relationship between two or more persons exists is conflict. Yet many people find themselves unprepared to handle conflicts since they have cultivated an attitude that considers conflict as a bad omen that ought not to exist and therefore should not even be anticipated. However, conflict is not bad. How conflict is managed determines the eventual outcome. The eventual outcome could be good or bad. 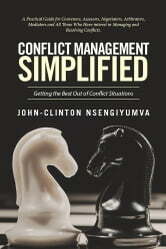 Unfortunately, due to lack of proper conflict management skills, most conflicts end up delivering bad outcome. To equip you with essential skills to manage conflictbe it at the individual level, family level, group level, organizational level, national or international levelthis book is divided into four major parts: part I, part II, part III, and part IV. Part I of this book delves into the nature of conflicts so that you are able to know and identify the various forms of conflict, how they arise, and what motivates them. It begins by defining what conflict is and goes further to highlight key elements of conflict, various kinds of conflict, various causes of conflicts, and rests with informing you why conflict is healthy. Both part II and part III dwell on the actual conflict management. Part II focuses on conflict assessment, whereby it equips you with necessary skills to assess the nature of a given conflict, the conflicting parties, and key stakeholders. It goes further to show you how to carry out conflict analysis, process design (for conflict resolution process), and write a report on your findings of the assessment. Part III equips you with the necessary skills required to carry out successful conflict resolution. It highlights two key processes involved in conflict resolutionconsensus building and negotiation. It shows you how these two processes are interrelated and the various approaches to carry them out in order to reach a possible settlement. Part IV gives special emphasis on certain other kinds of conflicts that may not necessarily involve the entire process as indicated in part II and part III, which may require a more specialized approach and attention. These conflicts include workplace conflict and marriage conflict. This book is definitely a good resource for those who intend to use it as a way of resolving conflicts in their personal lives, those who would like to specialize in conflict management, those already practicing conflict management and thus would like to gain further knowledge and skills or simply to refresh them, and lastly, to the general public that needs to more aware about the dynamics of conflicts. Ethical Occurrences in Government Contracting: Principled or Corrupt?